These are from Peru and are usually about 1/2 by 1 inches. Colors will vary, usually the brown ones. And, because they are hand - carved, shapes may vary slightly. These are sold in units of 5. If you want ten, $1.10 each, order 2 units, for 50, $1.05 each, order 10 units of 5 and for 100 (95 cents each) order 20. 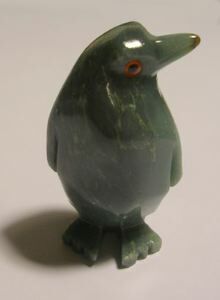 The soapstone animals are mixed for the pricebreak.